Facebook wants to know what's on my mind. Actually, that's not true; so far, it wants to know only what's on some of my friends' minds. Facebook doesn't care about me yet, although it promises that will soon change. Why is Facebook's news feed becoming so introspective? "It's going to be more about the message you want to send to others than what you're doing at that very moment," says Meredith Chin, Facebook's manager of corporate communications. Or as the company described it in a blog post: "One way to think about this is as a timeline  or a stream. As people share more ... the pace of updates accelerates." Sort of like those annoying tickers that run across the bottom of cable news channels, but all the news is about people who never get off their couches. The old status-update formula was simple, declarative: "Claire is working," "Claire is hungry," "Claire is unable to finish this article, so she is procrastinating by checking Facebook." But if I'm hungry and you ask me what's on my mind, what do I say? Do I just type "doughnuts" into the field? Then everyone I know will just see the update "Claire doughnuts." 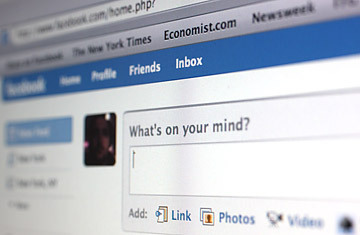 Read about Facebook's about-face on privacy.